Gude himself singled out this as one of his major works, and it was acquired by the Nationalmuseum in Stockholm the very year Gude painted it. 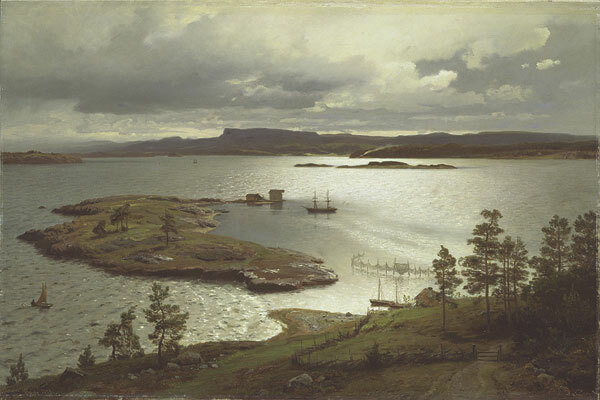 It is among his most outstanding representations of fjord scenery in south-eastern Norway. The view across the water at Sandviken, with the smoke of Høvik Glassworks visible on the distant shore, has been rearranged to a certain extent. And yet this painting, produced though it was without the artist having the subject before him, radiates immediacy. Gude had made the sketches he used for this composition six years previously, while he was staying at Snarøen in the summer of 1873. "That summer I could, to my heart's delight, paint the scenery that, when all is said and done, was closest to my heart, the landscape of my real home." Gude's wording here, written down a couple of decades later, has perhaps been influenced in the mean time by Erik Werenskiold's statement made in the 1880s, that if the Realists were to create anything of value they would have to keep to familiar, local subjects "because they cannot possibly understand what is foreign, and therefore cannot be as attached to it as to something that is theirs."